Straps are available in four colors. Natural, Medium Brown, Dark Brown, and Black. Offered in three widths, 1/2", 5/8" and 3/4". Four lengths are offered. 7.5", 10.25", 15" and 20". 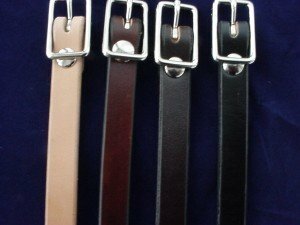 The length is measured from where the straps folds over the buckle to the end of the strap. 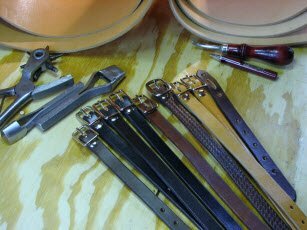 On average the buckle will add approximately 1/2" to the overall length. Call or email for additions lengths and widths. - Please Select - No Holes punch 3 holes punch 4 holes punch 5 holes punch 6 holes punch 7 holes Other; note in "Comments"
- Please Select - 1/2" 3/4" 1" Other: Note in "Comments"
- Please Select - 2" 3" 4" 5" Other; Note in "Comments"